In 1918, the Louisiana legislature passed Act 27 authorizing municipalities with over 50,000 residents to define and regulate the kind, style and manner of construction of buildings within their limits and to permit or prohibit the establishment and operation of businesses within designated areas. Subsequent legislation in the next few years extended the power for comprehensive zoning to all municipalities over 5,000 in population and provided for the creation of planning and zoning commissions to establish municipal guidelines for construction in residential, commercial and industrial districts. By the mid-1920s, the authorization to zone was firmly established by state law and by court rulings in various suits brought to test the new legislation. Prior to 1918, New Orleans had passed several hundred "spot" or "piecemeal" zoning ordinances governing construction of buildings or operation of businesses in certain blocks, streets or areas. By the 1920s, the result was a confusing, sometimes contradictory assortment of regulations, inconsistently enforced. In 1923, in response to this confusion and to a "plan movement" developing nationwide, the Commission Council established the City Planning and Zoning Commission (Ordinance 7353 CCS) to act in an advisory role to the Council on planning and zoning matters. In 1926, following the passage of the State Zoning Enabling Act (Act 240) and the City Planning Enabling Act (Act 305), the Behrman administration provided funding for the CPZC to hire the St. Louis firm of Harland Bartholomew and Associates to prepare a complete city planning survey, including plans for a comprehensive zone ordinance. 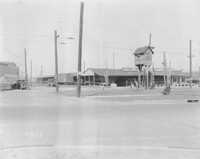 Bartholomew and Associates submitted a tentative zoning ordinance to the CPZC in June, 1927. Subsequently, the CPZC studied and revised the ordinance during thirty meetings held between June and October, 1927. The tentative ordinance was released to the public in late October, in preparation for 10 public hearings conducted by the CPZC in 8 public hearing districts between December 1, 1927 and January 19, 1928. The CPZC received 415 petitions from property holders and recommendations from various associations, all of which were numbered and mapped, listed and later studied by the CPZC Committee of Five on Zoning and the CPZC itself. Between September 1928 and January 1929, the Commission Council held a series of 11 public hearings on the tentative ordinance and considered the ordinance in additional executive sessions. Finally, the comprehensive zoning ordinance, 11,302 CCS (cal. 11,105) was passed on June 1, adopted on June 6, and became effective at midnight on June 11, 1929. The records are various materials gathered or created by the City Planning and Zoning Commission and/or Harlan Bartholomew and Associates in connection with the preparation of New Orleans's first comprehensive zoning ordinance, adopted by the Commission Council on June 6, 1929. Included are petitions, correspondence, and photographs submitted by citizens during the CPZC's public hearings on the tentative zone law; maps prepared for these hearings, for public information during the time when the tentative ordinance was under study and review, or for the use of the Commission Council during its deliberations on the ordinance; compilations of previous "piecemeal" zone ordinances; multiple drafts of the ordinance prepared for public review or for the use of the Council; newspaper copies of the proposed ordinance printed in the city's official journal; correspondence and reports produced by or for the City Planning and Zoning Commission on specific aspects of the ordinance; and stenographic records of the meetings held by the CPZC and public hearings conducted by the CPZC and the Commission Council. Original photographs included among the petitions submitted for CPCZ public hearings have been filed separately in the Municipal Government Photograph Collection. In the records, the photographs have been replaced by photocopies. Similarly, the deteriorating manilla folders in which the petitions were filed, which included detailed descriptions of the folders' contents, have also been replaced by photocopies; the original folders were discarded. Various other deteriorating labels to files or reports have also been photocopied and sometimes discarded. The folded, oversized maps included in this series are, for the most part, brittle and very fragile (some are done on badly deteriorating tracing paper; others are tearing along fold lines) and the archivists reserve the right to limit use. Maps of the various public hearing districts prepared by the CPZC show the owners of property within districts. Researchers using these records may also wish to consult the City Planning and Zoning Commission's Annual Reports and Minutes for the time period involved, the Official Proceedings of the Commission Council, and voluminous newspaper coverage of the zoning process. (Folder 2 includes 15 photographs taken on N. Broad St., in the vicinity of St. Bernard Ave.
5 "clue maps" -- # 1, 2A, 2B, 3, 4 -- showing consultants recommendations; changes by City Planning and Zoning Commission Committee of 3; 415 petitions; CPZC recommendations, etc.